After developing Dual Strike since almost 1-2 years we`re now at FW Version 3.1. * 20 screw terminal ports for connecting all of your wires. * USB type B jack for connecting any standard USB cable. * Piggyback interface for even easier installation of pass-through PCBs. * Integrated switch interface for USB pass-through functionality. Any two wire protcoll can be supplied to the switch. * Separate connection points for all power lines and signals. * Mounting holes for easy installation inside your arcade board or cab. Ok, before talking to much, here`re some pics. For making an independent review I`ll give Dual Strike PCBs for free. Reviewer should have some experience and a setup suitable for this device :cab or arcade stick and one or more of the consoles xbox1, PS3, PC with MAME setup, xbox360 (padhack needed). PM me if you`re interested to make a review. I could test this ... I have a couple of sticks here, which I just use for the mak ... do you think it's possible to install a Dual Strike parallel? PM sent. I'd be glad to check this out. review is on the way. currently we`re working on a alternative firmware for this board. This alternative firmware will include a trackball / spinner interface and has a configurable keyboard interface. bartop. To connect to the minipac inside the bartop would have required a 13 wire cable and connectors so the addition of a player 2 panel using the dual strike required just a usb connection. Running Mamedox on the Xbox and using the Dual Strike was as simple as plugging it in. No controller hack is required. The Dual Strike worked as soon as it was plugged in. 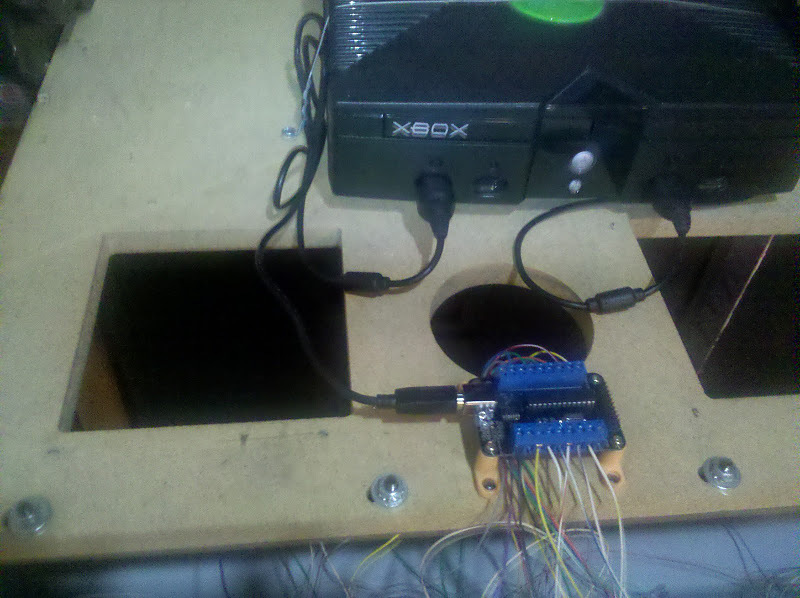 It was the easiest single player arcade controller that I have ever made for an Xbox. Thanks to Jan from the www.Arcadeshop.de for the test equipment. I compared it to trackball USB controller from ultimarc. It turns out that Dual Strike Trackball Firmware has a much higher resolution. All trackballs was working with Dual Strike. v3 is coming, any needs or wishes? To connect to the minipac inside the bartop would have required a 13 wire cable and connectors so the addition of a player 2 panel using the dual strike required just a usb connection. long time no update here. So here`re the pics of hardware version 3. Dual Strike comes no cleaned up connection in more comfortable screw terminal size 5mm. For external Padhacks there is the piggyback connector. I also can recommend using the Dual Strike for an xBox 1 application. After getting the correct cable in place (you probably already have one if you did a soft mod), the dual strike is truly plug and play on both xBox1 and PC MAME. The pic below is the Dual Strike test wired in the Dynamo HS-5 cabinet with a custom soldered xBox male to USB Type B male connector. This is super easy to make as you just connect the same color wire and disregard the yellow wire coming from the xBox. I'll do a more formal write up later. I'm now testing the x360 functionality by adding a pad hack. I can now swap the USB plug between my PC, xBox1, and x360 without having to change anyhting. The Autodetect functionality works great! I don't have to mess around with pushing buttons when I turn on a console, this would be a pain since I have my consoles and PC in a cabinet. I used a x360 brawlpad and an old IDE harddrive cable.